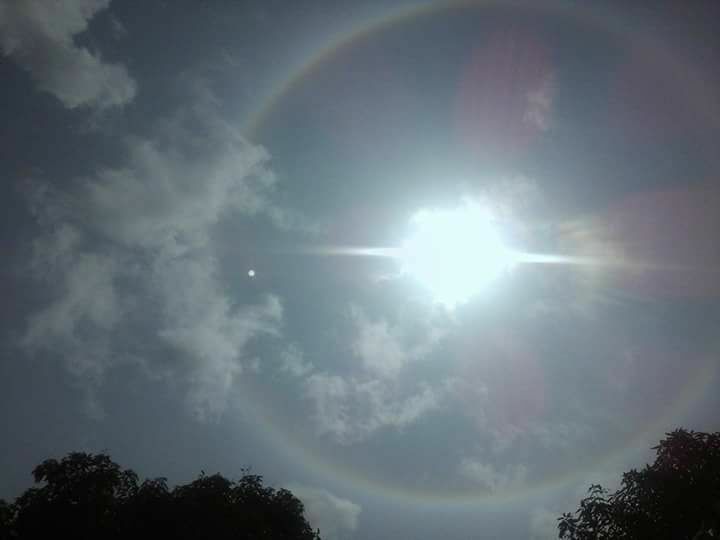 This is the first time in human history that a rainbow formed a perfect circle. 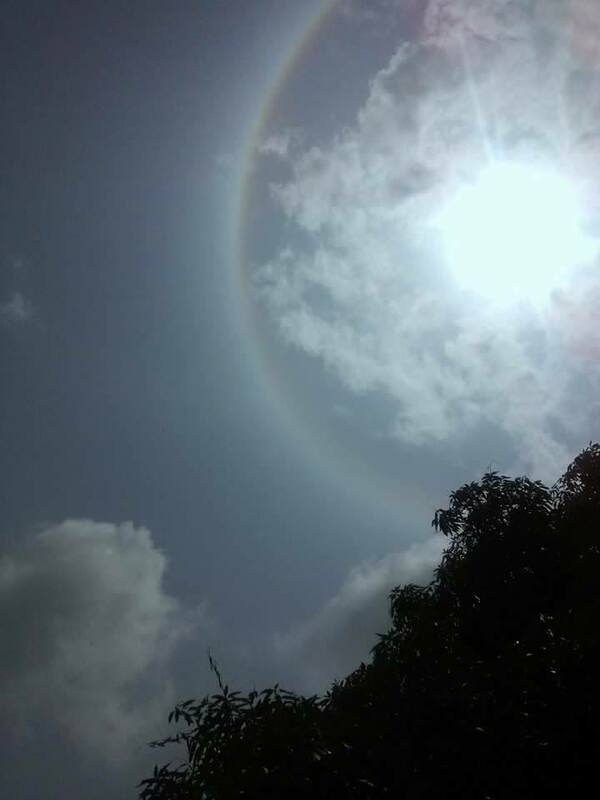 Not only that, a rainbow has never encircled the sun before, but today a rainbow encircled the Sun. Thirdly a star appeared in the afternoon in living memory and sat in the circle near the sun. All these happened today in Afaraukwu Ibeku the hometown of Nnamdi Kanu as he received IPOB members. Biafra is the Kingdom of Heaven on earth. When we said we are the children of Light we knew what were were talking about, even God himself has confirmed it. 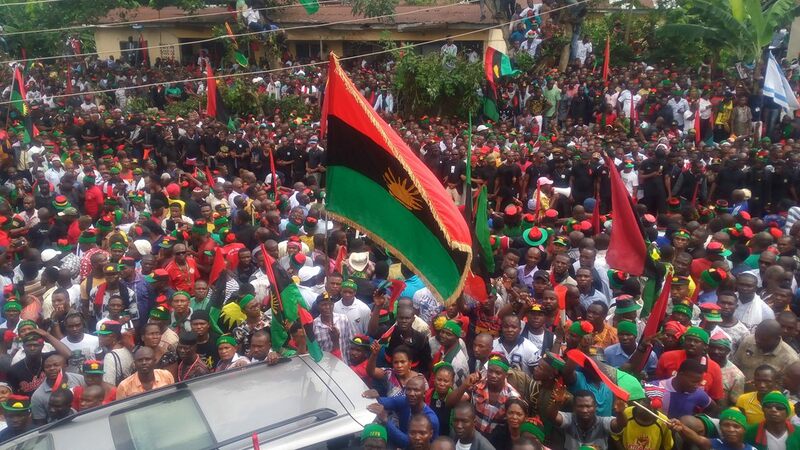 UMUAHIA – SEVEN pro-Biafra groups Wednesday agreed to work together under the leaders of Nnamdi Kanu, leader of the Indigenous People of Biafra, IPOB, with the aim of achieving faster the their quest for referendum that will lead to the emancipation of Republic of Biafra. The groups said that they decided to work together so that they would be speaking with one voice seeking for one objective of securing the Republic of Biafra. Well over 5000 people from the various groups converged on Afaraukwu, native home of Nnamdi Kanu to witness his appointment as the over leader of Biafra. The groups were the Movement for the Sovereign State of Biafra, MASSOB, Biafran Revolutionary Organization, BRO, Eastern People Congress, EPC, Joint Revolutionary Council of Biafra, JRCB, Biafra Liberation Crusaders, BLC, and Salvation People of Biafra, all of who agreed to work indiscriminately with the Nnamdi Kanu led IPOB to pursue the Republic Biafra. Rising from a closed down with Kanu, Comrade Uchenna Madu addressed journalists on their decision. He said the decision was to work together and speak with one voice under a central leader, saying however that all the groups still exist but would be speaking with one voice more so as the quest for referendum hits up. “Distinguished members and great people of Biafra and supporters of divine mission of emancipation of the land of Biafra from the oppressing Nigeria State, we salute you. Today as we stand in this holy land of Bifra in unique and brotherly gathering to honour our own brother who distinguished himself in the self determination struggle for Biafra actualization and restoration. “Today in honour of our supreme leader, Chukwu Okike Abiama and in remembrance of Dim Chukwuemeka Odumegwu Ojukwu, we the people of Biafra under the representation of all the pro-Biafra groups hereby adopt and declare our brother, Mazi Nnamdi Kanu as the new leader of Biafra Nation, whose under his leadership, through the grace of Chukwu Okike Abiama shall the people of Biafra rest. “Mazi Nnamdi Kanu’s leadership shall bring unity, peace, progress and brotherly love among the esteemed people of Biafra through the instrumentality of mutual and intimate understanding among the pro-Biafra groups”, the declaration read by MASSOB leader, Comrade Uchenna Madu said. In his reaction, Nnamdi Kanu said that he was humbled by the decision of the various groups and assured that h would not let them down. “I am humbled by this decision of the groups, we started together and we have all ended up together because we are sincere and purposeful. I am not in the habit of letting my friends down, that thing you said I cannot do is what I will down. “Everybody will be carried along; if I am invited for any meeting I will take some people along. Today is a great day for Biafran all over the world. Today we have shamed our enemies think that we cannot come together, who think that if when we get Biafra we will kill ourselves, we have shamed them”. In answer to a question, Kanu said he did not believe in the restructuring of Nigeria being called by eminent Nigeria, saying that Nigerian Government would not keep any agreement reached in the restructuring exercise. According to him, it is a referendum or nothing. He said that Aburi agreement was reneged by Nigerian Government and that the 2014 National Conference was dumped where it was coated by dust until the Biafra agitation became intense and it was remembered. On whether the IPOB has formerly written to the United Nations demanding referendum, Kanu said that the best letter was the continuous civil disobedience which he said serves as “handwriting on the wall for the Government, they wake up to see it every day”. “We are going to compel the powers that be to recognize the inevitability of the referendum. Man made the law, man will change it. We will continue to deploy civil disobedience. It is not war, it is self-determination”, Kanu said. A United Nations observer, Prof. Nwaimo Emma was around yesterday to see what was going on. According to Nwaimo, who said he is a professor of religion, he was overwhelmed with the crowd he saw and said that he would report back to the United Nations the true position of what he observed. Meanwhile, the leader of Afenifere Youths, Eric Olawale has said that the Afenifere youths have totally lost confidence in the leadership of the Inspector General of Police, Ibrahim Idris over his failure to arrested the Arewa Youths who gave the Igbo quit notice from the North. Olawale also said that they have lost confidence in the Northern governors over the same issue, saying with their action they have failed to provide leadership. Olawale who said he was in Umuahia in solidarity with Nnamdi Kanu and other pro-Biafra groups, said that they are also keenly interested in having Oduduwa Republic. He said that they came to give support to Kanu because they all part of Southern Nigeria, and will not watch and see their brother being punished.